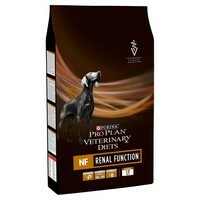 Purina Pro Plan Veterinary Diets NF Renal Function Dry Dog Food is a complete veterinary diet for dogs to support kidney functions in cases of chronic kidney disease. The diet contains limited amounts of high quality protein to help minimise development of the protein breakdown products (uraemic toxins) which make patients feel unwell, while helping to maintain muscle mass. Our ex racing Greyhound was diagnosed with kidney problems by a Vet about a year ago. From then we were advised to put our Greyhound on a low protein and phosphate diet. Purina Vet diets NF is great and our Greyhound eats it okay and has improved greatly since being fed it.